How to help citizens with special medical needs during disasters? WHY THE CLIENT NEEDED US? TeleTracking is a leader in the field of patient and hospital bed flow management for hospitals in the united states. They go by the motto "No one shoould have to wait for the care they need". For their next phase of their business, they want to extend this same care to the community. TeleTracking wanted us to create a solution for citizens disaster prone areas which would in turn help their hospital clients who received a surge of uninjured people to come there to seek shelter during disasters. Hurricanes are the most common type of natural disaster occurring in the US and cause more damage than all other disaster types combined. Digging deeper into these numbers, a pattern emerges about how people with medical conditions or the elderly face greater hardships - namely because of their lack of mobility, dependencies on others for care, and unique resource needs. For those who rely on electricity for their assistive devices, losing power during a storm can be a life or death situation. When an evacuation is ordered and temporary shelter locations were not identified, these individuals will go to a hospital to ensure their devices remain functional. Haven is a mobile app for caregivers that helps them and their patients to better prepare themselves to survive hurricanes and to relocate to medical shelters rather than hospitals. special medical needs patients the worst hit during disaster they are also the most overlooked in the terms of existing hurricane solutions. So in phase 2, we decided to focus our solution on these patients and conducted more in-depth interviews and user tests with caregivers, special medical needs patients and medical shelters from various counties. During a disaster, anyone wants to be close to places they are most familiar and comfortable in. Most people will try to stay at their own homes till the last minute, they will then choose a family or friends house and only in the end they will think about evacuating to other places. County emergency medical shelters are chronically under-registered, and citizens often don't know what resources exist. In one county out of the 27,000 special medical needs patients, only 990 of them had registered. Through conversations with TeleTracking customers, the team heard specific and recent stories about the impact of Hurricane Irma. 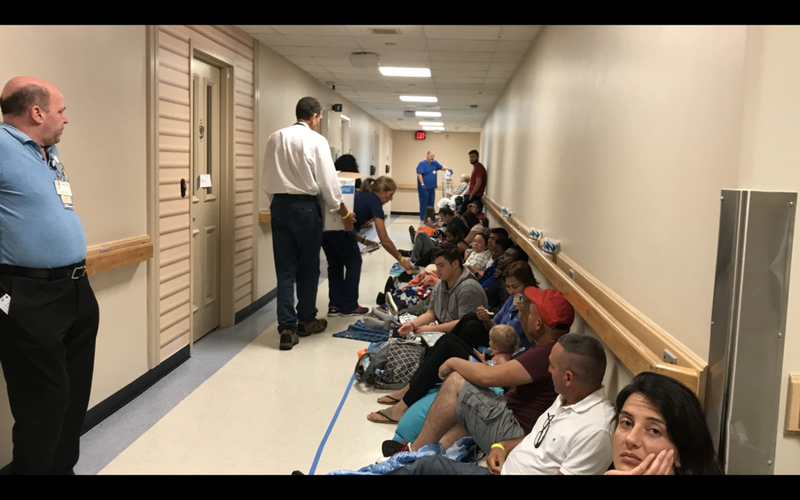 Even though hospitals routinely go through emergency drills, the severity of this storm caused unforeseen problems. Screen flow adjusts based on self-defined role. Caregivers are the primary target user, and are encouraged to register their loved one for a medical emergency shelter. Other user types would not navigate to this step automatically. Sections of the Florida State Special Needs Registry were divided into cards for easier navigation and content organization. Based on previously-entered data, different sections will appear as new cards - so users fill out no more than the required information. The icon next to each term provides definitions and clarity. Cards are grouped by week so that tasks seem more manageable. Overall preparation is displayed at top of screen to provide additional motivation. The team storyboarded a variety of ideas before landing on the final solution concept which was referred to as "Redirection" (lower right). By consolidating these different concepts, we arrived at our key users/stakeholders and solution goals. The team conducted three rounds of user testing at various fidelities, including in person think-alouds with residents in Tampa. Below is a glimpse of the research protocol the team used to quantify the insights from the user testing. The user tests were conducted with caregivers ( both family and paid), medical shelters, county officials and also general citizens from Florida, who are used to facing these seasonal disasters every year. We used a method that allowed us to cluster the interview insights which enabled us to see patterns and decipher how many people responded positively or negatively for any given feature. The results from these were used to inform the feature lists and design changes. The prototype that was delivered was the result of six major iterations which incorporated feedback from our test groups. Apart from the 3 stakeholders i.e Caregivers, special medical needs patients and medical shelters, haven creates value for hospitals as well. We conducted an onsite card sorting exercise and interview to understand the specific mental model of the employees of a hospital in disaster zones. In the short term, by encouraging citizens to remain safely at home or to go to a medical shelter if they can - there will be a reduction in the numbers of people choose to evacuate to a hospital. For those who cannot or won’t go to a shelter, our app will provide descriptive information about their condition and their household and with this data, hospitals can more accurately predict the numbers and the needs of the people who may be sheltering with them. HOW MIGHT WE DRIVE PEOPLE TO USE OUR SOLUTION? 100% of people we tested with reported that they would be more inclined to download an app that partnered with the Red Cross versus one with no visible partnership in place. “Doctors recommendations are very powerful with this generation. There is the mindset that a doctor knows everything”. So a referral from a physician is trustworthy and taken seriously. HOW MIGHT WE DESIGN FOR ROUTINE USE? Haven can exist as a standalone app but can also be unbundled. Unbundling allows relevant features to be embedded into the existing tools that caregivers already use, which can reduce the challenge of getting people to use a new app consistently. Family caregivers are often responsible for monitoring medications and refilling prescriptions for their loved one. An important component of preparedness includes documenting prescription orders and having an extra supply of medications on hand. If this and other preparation tips are included in apps from two of the largest pharmacy chains in the US, millions of people could be reached. Syncing medical shelter registration with a healthcare system app creates an opportunity to eliminate inefficiencies in form completion. Caregivers have access to their loved one’s medical records but may still struggle with understanding the terms used in the registration form. If the right security protocols and privacy permissions are in place, information could be passed directly to the form without the caregiver having to enter it manually, and avoiding input errors. There is no single app which family caregivers seem to use above all others. But because they take their roles as emergency planners seriously, building in the preparation and evacuation features to any of the existing apps could help boost their popularity. We designed Haven to be used by family caregivers and others in Florida. While certainly a large population to start, future iterations can include other hurricane-prone areas or other disaster types. We tested a paper prototype locally, changing our context of use from “hurricane” to “snowstorm”. Both events are similar in that they are seasonal, slow moving, and can cause loss of power and mobility. The local tester still saw value in the features we designed, implying that a major redesign is not necessary to make this useful for other natural disasters. In the long term, there is a possibility to use sensing and IoT technologies to share real-time capacity in shelters and other facilities with users - which can smartly re-route them to other evacuation sites. The team’s final user testing session was conducted remotely with Florida residents. We used a think-aloud protocol to test screen elements, UI, and navigation. Our intent was to uncover where our design needed adjustment, but we also received some candid feedback about the overall concept. You can hear excerpts from some of these sessions now.